Tuqiri emerged as a star of the game in the 13-man code where he impressed for the Brisbane Broncos in the NRL and Queensland in the State of Origin series. His rugby league career, which spanned 1999-2002, also saw him captain his native Fiji at the 2000 World Cup before going on to represent Australia at international level. His displays caught the eye of the Australian Rugby Union and, in 2001, he announced that he would be switching codes the following year. Only 22 at the time, he opted to sign with the Waratahs despite interest from the Brumbies, having already decided against joining former Broncos team mate Wendell Sailor at the Queensland Reds. His speed and strength soon brought him to the attention of the international selectors and he subsequently made his international debut for the Wallabies against Ireland in June 2003. He became Australia's 43rd dual-code rugby international. Selection for the 2003 World Cup squad followed and he scored three tries including one in the agonising final defeat to England. The following year was notable, with Tuqiri leading the Wallabies' try-scoring stats with 10 in 12 Tests. It was in 2005 that Tuqiri's off-the-field disciplinary problems hit the headlines when he was handed a suspended two-match ban for his part in a late-night drinking incident in a Cape Town while on duty with the Wallabies. 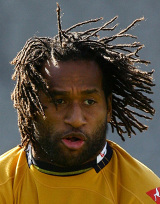 A series of injuries on Australia's European tour in 2005 forced Tuqiri to switch positions to centre, but he was back on the wing the following year. In 2006 he represented Australia 7s at the Commonwealth Games and the same year he helped the Waratahs reach the semi-finals of the Super 14. But he again hit the headlines for the wrong reasons when he was handed a five-match ban for a dangerous spear tackle on All Blacks captain Richie McCaw. He ended the year by reaching his 50th Test when he played against Scotland in Edinburgh. Tuqiri was the subject of much speculation over the next few months, as he weighed up a possible move back to rugby league. After being given a deadline to accept or decline a fresh contract offer from the ARU, the winger eventually committed his future to the Waratahs and the Wallabies in March 2007. Tuqiri had most probably his worst season in 2007 both on and off the field. He was sent home from a World Cup training camp after failing a fitness test in January, then later admitted that six months of contract negotiations had affected his Super 14 form. While he struggled to find his best form on it he once again courted controversy off it. He was involved in an ugly incident when he shoved his team-mate Sam Norton-Knight in the back, giving him a verbal spray for an on-field mistake. He was forced to issue a public apology. In May, he was reportedly fined for his part in the 'Peter Hewat phone scandal''. Tuqiri left Wallabies selector Michael O'Connor red-faced after placing his mobile on loudspeaker during a conversation between the in which O'Connor was highly critical of Waratahs teammate Hewat - who was present at the time. Tuqiri got some further bad news when Wallabies coach John Connolly confirmed his star winger would miss the two tests against Wales to work on increasing his speed. More trouble followed in July when he was hit with a two-match suspension and hefty fine for another breach of team discipline. Tuqiri was breath-tested after missing a medical appointment and a midday recovery session at the team's base in Sydney. That transgression activated his previous two-match suspended ban. As a result, Tuqiri did not play again until the Wallabies began their 2007 Rugby World Cup campaign against Japan. Tuqiri reached a career landmark with his 50th international try in the quarter final loss to England. The following year was a season of milestones for Tuqiri in Waratahs clours as he surpassed Matt Burke's Super Rugby try-scoring record and surpassed Scott Staniforth to become NSW's most-capped winger. The Waratahs, with Tuqiri back on form, also reached the 2008 Super 14 Final where they were beaten by the Crusaders. As a result Tuqiri, who subsequently turned down approaches from French Top 14 club Bayonne, retained his place in the Wallabies' ranks with the arrival of new coach Robbie Deans. On July 1, 2009 the Australian Rugby Union announced that they had terminated Tuqiri's contract with immediate effect. His lawyer has said that they would be challengng the termination through legal procedings. His contract with the ARU was only due to expire in 2012. After months of speculation following the controversy, Tuqiri announced that he had signed for Premiership side Leicester where he completed a short stay before opting for a return to the NRL with Wests Tigers.